With the 2015 Oscars fast approaching and competition as fierce as ever, here’s a rundown of our top 10 most memorable Oscars’ moments of all time. What we’re kicking off with is less of a moment and more of an ordeal. When James Franco and Anne Hathaway took to the stage to host the 83rd Annual Academy Awards, we were treated to a night full of awkward jokes, forced laughter and uncomfortable silences. This pairing will go down in history for their complete lack of chemistry. Cuba Gooding, Jr. couldn’t hold in his delight in 1997 when he won Best Supporting Actor for his role in Jerry Maguire. In what has to be one of the most exuberant speeches in Oscars history, Cuba’s contagious happiness and ecstatic leap of joy brought the entire audience to their feet. Proof that although he is gone, he’s never forgotten; Heath Ledger posthumously won the award for Best Supporting Actor in The Dark Knight at the 2009 ceremony. His family accepted the award on his behalf, delivering a moving and humbling speech that brought many in the audience to tears. In what was to be his last public appearance before he lost his battle with cancer, John Wayne presented the Best Picture award in 1979. As the crowd rose to give him a standing ovation, he said: “That’s just about the only medicine a fella’d ever really need.” He passed away just two months later. 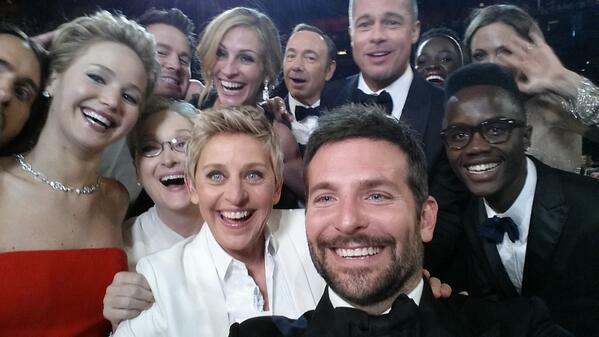 The moment Ellen DeGeneres decided to jump on the selfie bandwagon at the 2014 Oscars, history was made. In what became the most retweeted tweet of all time (3.36million retweets and counting! ), a host of famous faces crowded together for the ultimate celebrity pic. Featuring Bradley Cooper, Meryl Streep, Jennifer Lawrence, Jared Leto, Julia Roberts, Kevin Spacey, Brad Pitt, Lupita Nyong’o and Angelina Jolie amongst others… there’s no question that this was a pretty iconic moment.